View the cervical spine as 3 distinct columns: anterior, middle, and posterior. The anterior column is composed of the anterior longitudinal ligament and the anterior two thirds of the vertebral bodies, the annulus fibrosus and the intervertebral disks. The middle column is composed of the posterior longitudinal ligament and the posterior one third of the vertebral bodies, the annulus and intervertebral disks. The posterior column contains all of the bony elements formed by the pedicles, transverse processes, articulating facets, laminae, and spinous processes. If one column is disrupted, other columns may provide sufficient stability to prevent spinal cord injury. 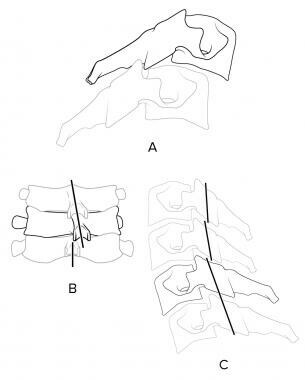 If 2 columns are disrupted, the spine may move as 2 separate units, increasing the likelihood of spinal cord injury. Apical, alar, and transverse ligaments provide further stabilization by allowing spinal column rotation; this prevents posterior displacement of the dens in relation to the atlas. When a cervical spine injury is suspected, neck movement should be minimized during transport to the treating facility. Ideally, the patients should be transported on a backboard with a semirigid collar, with the neck stabilized on the sides of the head with sand bags or foam blocks taped from side to side (of the board), across the forehead. A standard trauma series is composed of 5 views: cross-table lateral, swimmer's, oblique, odontoid, and anteroposterior. Approximately 85-90% of cervical spine injuries are evident in lateral view, making it the most useful view from a clinical standpoint. For more information, see Medscape's Fracture Resource Center and Spinal Disorders Resource Center. With a pure flexion injury, a longitudinal pull is exerted on the nuchal ligament complex that, because of its strength, usually remains intact. The anterior vertebral body bears most of the force, sustaining simple wedge compression anteriorly without any posterior disruption. Radiographically the anterior border of the vertebral body has diminished height and increased concavity along with increased density due to bony impaction (see the image below). The prevertebral soft tissues are swollen. (A) Simple wedge fracture with a flexion mechanism of injury is stable. (B) Flexion teardrop fracture with a flexion mechanism is unstable. The posterior column remains intact, making this a stable fracture that requires only use of a cervical orthosis for treatment. A flexion teardrop fracture occurs when flexion of the spine, along with vertical axial compression, causes a fracture of the anteroinferior aspect of the vertebral body. This fragment is displaced anteriorly and resembles a teardrop (see the image below). For this fragment to be produced significant posterior ligamentous disruption must occur. Since the fragment displaces anteriorly, a significant degree of anterior ligamentous disruption exists. This injury involves disruption of all 3 columns, making this an extremely unstable fracture that frequently is associated with spinal cord injury. Initial management is application of traction with cervical tongs. Anterior subluxation in the cervical spine occurs when posterior ligamentous complexes (nuchal ligament, capsular ligaments, ligamenta flava, posterior longitudinal ligament) rupture. The anterior longitudinal ligament remains intact. No associated bony injury is seen. Radiographically, the lateral view shows widening of interspinous processes, and anterior and posterior contour lines are disrupted in flexion views (see the image below). Since the anterior columns remain intact, this fracture is considered mechanically stable by definition. Anterior subluxation with a flexion mechanism is stable in extension but potentially unstable in flexion. Anterior subluxation is rarely associated with neurologic sequelae. Nevertheless, most authorities approach this injury as if it were potentially unstable because of the significant displacement that can occur with flexion, and very rare cases have associated neurologic deficit. Bilateral facet dislocation is an extreme form of anterior subluxation that occurs when a significant degree of flexion and anterior subluxation causes ligamentous disruption to extend anteriorly, which causes significant anterior displacement of the spine at the level of injury. This injury involves the annulus fibrosus, anterior longitudinal ligament and posterior ligamentous complex. At the level of injury, ie, the upper vertebrae, inferior articulating facets pass superior and anterior to the superior articulating facets of the lower involved vertebrae because of extreme flexion of the spine. Radiographically, this is seen as a displacement of more than half of the anteroposterior diameter of the vertebral body in the lateral view (see the image below). Bilateral facet dislocation with a flexion mechanism is extremely unstable and can have an associated disk herniation that impinges on the spinal cord during reduction. This is an extremely unstable condition and is associated with a high prevalence of spinal cord injuries. Initial management is closed reduction and traction with cervical tongs. A significant number of bilateral facet dislocations are accompanied by disk herniation. In patients with these injuries further neurologic damage may occur if the injured disk retropulses into the canal during the application of cervical traction. Therefore, a careful neurologic examination should accompany closed reduction in these patients. Abrupt flexion of the neck, combined with a heavy upper body and lower neck muscular contraction, results in an oblique fracture of the base of the spinous process, which is avulsed by the intact and powerful supraspinous ligament. Fracture also occurs with direct blows to the spinous process or with trauma to the occiput that causes forced flexion of the neck. Injury commonly is observed in a lateral view, since the avulsed fragment is readily evident (see the image below). Injury commonly occurs in lower cervical vertebrae; therefore, visualization of the C7-T1 junction in the lateral view is imperative. Injury also may be seen in the anteroposterior view as a vertically split appearance of the spinous process in the lower vertebrae. Clay shoveler fracture. (A) Lateral view of this fracture caused by a flexion mechanism shows that it is stable and represents an avulsion fracture of the base of the spinous process near the supraspinous ligament. 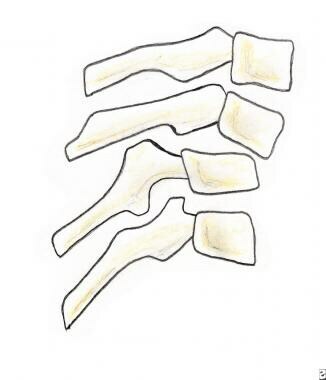 (B) Anteroposterior view shows the vertically split appearance of the spinous process. Since injury involves only the spinous process, this fracture is considered stable, and it is not associated with neurologic impairment. Management involves only cervical immobilization with an orthotic device for comfort. Common injuries associated with a flexion-rotation mechanism include unilateral facet dislocation and rotary atlantoaxial dislocation. 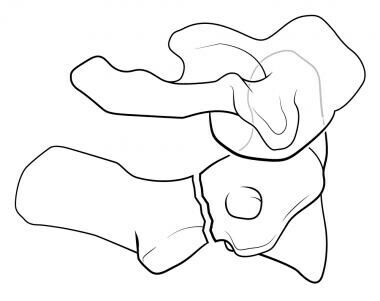 Unilateral facet dislocation occurs when flexion, along with rotation, forces one inferior articular facet of an upper vertebra to pass superior and anterior to the superior articular facet of a lower vertebra, coming to rest in the intervertebral foramen (see the image below). Unilateral facet dislocation. (A) Lateral view of this fracture caused by a flexion-rotation mechanism shows that it is stable. Anterior displacement of spine is less than one half of the diameter of a vertebral body. (B) Anteroposterior view shows disruption of a line connecting spinous processes at the level of the dislocation. (C) Oblique view shows that the expected tiling of the laminae is disrupted, and the dislocated superior articulating facet of the lower vertebra is seen projecting within the neural foramina. Although the posterior ligament is disrupted, vertebrae are locked in place, making this injury stable. Radiographically, the lateral view shows an anterior displacement of the spine at the involved level of less than one half the diameter of the vertebral body. This is in contrast to the greater displacement seen with a bilateral facet dislocation, as discussed above. The anteroposterior view is useful in diagnosis of unilateral dislocation because it shows a disruption in the line connecting the spinous processes at the level of the dislocation (see the image below). The oblique view is also useful because it shows a disruption of the typical shingles appearance at the level of the involved vertebra. The dislocated superior articulating facet of the lower vertebra is seen projecting within the neural foramina. The injury seldom is associated with neurologic deficits. The orthopedic consultant performs initial management, applying cervical traction to attempt closed reduction. This injury is a specific type of unilateral facet dislocation. Radiographically, the odontoid view shows asymmetry of the lateral masses of C1 with respect to the dens along with unilateral magnification of a lateral mass of C1 (wink sign). However, since the atlantoaxial joint permits flexion, extension, rotation, and lateral bending, radiographic asymmetry is produced when the head is tilted laterally or rotated or if a slightly oblique odontoid view is obtained despite perfect head positioning. To confirm true dislocation, basilar skull structures (jugular foramina) should appear symmetric in the presence of the findings described above. This injury is considered unstable because of its location. Common injuries associated with an extension mechanism include hangman fracture, extension teardrop fracture, fracture of the posterior arch of C1 (posterior neural arch fracture of C1) and posterior atlantoaxial dislocation. The name of this injury is derived from the typical fracture that occurs after hangings. Presently, it commonly is caused by motor vehicle collisions and entails bilateral fractures through the pedicles of C2 due to hyperextension. Radiographically, a fracture line should be evident extending through the pedicles of C2 along with obvious disruption of the spinolaminar contour line (see the image below). Hangman fracture caused by an extension mechanism is unstable. Fracture line is evident in the lateral projection extending through pedicles of C2, along with disruption of the spinolaminar line. Sometimes, this fracture is associated with unilateral or bilateral facet dislocation, which makes it highly unstable. Although considered an unstable fracture, it seldom is associated with spinal injury, since the anteroposterior diameter of the spinal canal is greatest at this level, and the fractured pedicles allow decompression. When associated with unilateral or bilateral facet dislocation at the level of C2, this particular type of hangman fracture is unstable and has a high rate of neurologic complications that require immediate referral for cervical traction to reduce the facet dislocation. All other types of hangman fracture can be managed initially with a cervical orthotic device. As with flexion teardrop fracture, extension teardrop fracture also manifests with a displaced anteroinferior bony fragment. This fracture occurs when the anterior longitudinal ligament pulls fragment away from the inferior aspect of the vertebra because of sudden hyperextension. The fragment is a true avulsion, in contrast to the flexion teardrop fracture in which the fragment is produced by compression of the anterior vertebral aspect due to hyperflexion. The fracture is common after diving accidents and tends to occur at lower cervical levels. It also may be associated with the central cord syndrome due to buckling of the ligamenta flava into spinal canal during the hyperextension phase of injury. This injury is stable in flexion but highly unstable in extension. Initial management is avoidance of iatrogenic extension and cervical traction with tongs. This fracture occurs when the head is hyperextended and the posterior neural arch of C1 is compressed between the occiput and the strong, prominent spinous process of C2, causing the weak posterior arch of C1 to fracture (see the image below). (A) Fracture of the posterior arch of C1 fracture caused by an extension mechanism is stable. Lateral projection shows a fracture line through the posterior neural arch without widening predental space. An odontoid view must be obtained to differentiate this benign fracture from a Jefferson fracture. (B) Jefferson fracture caused by a vertical (axial) compression mechanism is unstable. This fracture of all aspects of the C1 ring is associated with possible disruption of the transverse ligament of the atlas. Lateral projection may show a widened predental space and a fracture through the posterior arch of C1. Odontoid view shows displacement of the lateral masses of C1, allowing distinction of this fracture from a simple fracture of the posterior neural arch of C1. Radiographically, the lateral projection shows a fracture line through the posterior neural arch. The odontoid view fails to show any displacement of the lateral masses of C1 with respect to the articular pillars of C2, a finding that distinguishes this fracture from a Jefferson fracture. The transverse ligament and the anterior arch of C1 are not involved, making this fracture stable. Initial management involves the differentiation of this benign fracture from a Jefferson fracture. Once this is accomplished, only use of a cervical orthosis is required. Common injuries associated with a vertical compression mechanism include Jefferson fracture (burst fracture of the ring of C1), burst fracture (dispersion, axial loading), atlas fracture, and isolated fracture of the lateral mass of C1 (pillar fracture). This fracture is caused by a compressive downward force that is transmitted evenly through the occipital condyles to the superior articular surfaces of the lateral masses of C1. The process displaces the masses laterally and causes fractures of the anterior and posterior arches, along with possible disruption of the transverse ligament. Quadruple fracture of all 4 aspects of the C1 ring occurs. Radiographically the fracture is characterized by bilateral lateral displacement of the articular masses of C1. The odontoid view shows unilateral or bilateral displacement of the lateral masses of C1 with respect to the articular pillars of C2; this finding differentiates it from a simple fracture of the posterior neural arch of C1 (see the image below). The lateral projection usually reveals a striking amount of prevertebral soft tissue edema. When displacement of the lateral masses is more than 6.9 mm complete disruption of the transverse ligament has occurred and immediate referral for cervical traction is warranted. If displacement is less than 6.9 mm, the transverse ligament is still competent and neurologic injury is unlikely. When downward compressive force is transmitted to lower levels in the cervical spine, the body of the cervical vertebra can shatter outward, causing a burst fracture. This fracture involves disruption of the anterior and middle columns, with a variable degree of posterior protrusion of the latter. Radiographically, this fracture is evidenced by a vertical fracture line in the frontal projection and by comminution and protrusion of the vertebral body anteriorly and posteriorly with respect to the contiguous vertebrae in the lateral view (see the image below). Burst fracture of vertebral body caused by a vertical (axial) compression mechanism is stable mechanically and involves disruption of the anterior and middle columns, with variable degree of protrusion of the latter. This middle column posterior protrusion may extend into the spinal canal and be associated with an anterior cord syndrome. Posterior protrusion of the middle column may extend into the spinal canal and can be associated with anterior cord syndrome. Burst fractures always require an axial CT scan or MRI to document amount of middle column retropulsion. Initial management of burst fractures with a loss in height of more than 25%, retropulsion, or neurologic deficit is accomplished by applying traction with cervical tongs. When none of those problems exist, the fracture is considered stable. Common injuries associated with multiple or complex mechanisms include odontoid fracture, fracture of the transverse process of C2 (lateral flexion), atlanto-occipital dislocation (flexion or extension with a shearing component), and occipital condyle fracture (vertical compression with lateral bending). Injuries at the upper cervical level are considered unstable because of their location. Nevertheless, since the diameter of the spinal canal is greatest at the level of C2, spinal cord injury from compression is the exception rather than the rule. Incompletely understood mechanisms or a combination of mechanisms usually produce injuries encountered at this level. Common injuries include fracture of the atlas, atlantoaxial subluxation, odontoid fracture, and hangman fracture (see Extension injury above). Less common injuries include occipital condyle fracture, atlanto-occipital dislocation, atlantoaxial rotary subluxation (see Flexion-rotation injury above), and C2 lateral mass fracture. Four types of atlas fractures (I, II, III, IV) result from impaction of the occipital condyles on the atlas, causing single or multiple fractures around the ring. The first 2 types of atlas fracture are stable and include isolated fractures of the anterior and posterior arch of C1 (posterior arch fracture is described under Extension injury). Anterior arch fractures usually are avulsion fractures from the anterior portion of the ring and have a low morbidity rate and little clinical significance. The third type of atlas fracture is a fracture through the lateral mass of C1. Radiographically, asymmetric displacement of the mass from the rest of the vertebra is seen in the odontoid view. This fracture also has a low morbidity rate and little clinical significance. The fourth type of atlas fracture is the burst fracture of the ring of C1 and also is known as a Jefferson fracture (discussed under Vertical (axial) compression injury above). This is the most significant type of atlas fracture from a clinical standpoint because it is associated with neurologic impairment. 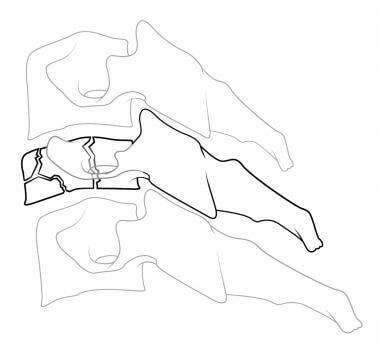 Initial management of types I, II, and III atlas fractures consists of placement of a cervical orthosis. Type IV fracture, or Jefferson fracture, is managed with cervical traction. When flexion occurs without a lateral or rotatory component at the upper cervical level, it can cause an anterior dislocation at the atlantoaxial joint if the transverse ligament is disrupted. Because this joint is near the skull, shearing forces also play a part in the mechanism causing this injury, as the skull grinds the C1-C2 complex in flexion. Since the transverse ligament is the main stabilizing force of the atlantoaxial joint, this injury is unstable. Neurologic injury may occur from cord compression between the odontoid and posterior arch of C1. Radiographically, this injury is suspected if the predental space is more than 3.5 mm (5 mm in children); axial CT is used to confirm the diagnosis. These injuries may require fusion of C1 and C2 for definitive management. When severe flexion or extension exists at the upper cervical level, atlanto-occipital dislocation may occur. Atlanto-occipital dislocation involves complete disruption of all ligamentous relationships between the occiput and the atlas. Death usually occurs immediately from stretching of the brainstem, which causes respiratory arrest. Radiographically, disassociation between the base of the occiput and the arch of C1 is seen. Cervical traction is absolutely contraindicated, since further stretching of the brainstem can occur. The 3 types of odontoid process fractures are classified based on the anatomic level at which the fracture occurs (see the image below). Odontoid fractures. (A) Type I odontoid fracture represents an avulsion of the tip of the dens at the insertion site of the alar ligament. Although mechanically stable, it is associated with life-threatening atlanto-occipital dislocation. 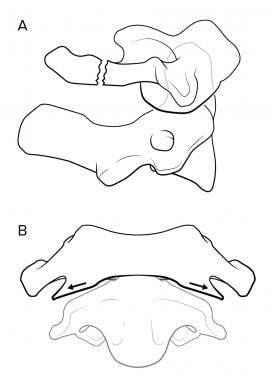 (B) Type II odontoid fracture is a fracture at the base of the dens. This is the most common type of odontoid fracture. (C) With type III odontoid fracture, the fracture line extends into the body of the axis. Type I odontoid fracture is an avulsion of the tip of the dens at the insertion site of the alar ligament. Although a type I fracture is mechanically stable, it often is seen in association with atlanto-occipital dislocation and must be ruled out because of this potentially life-threatening complication. Type II fractures occur at the base of the dens and are the most common odontoid fractures. This type is associated with a high prevalence of nonunion due to the limited vascular supply and small area of cancellous bone. Type III odontoid fracture occurs when the fracture line extends into the body of the axis. Nonunion is not a major problem with these injuries because of a good blood supply and the greater amount of cancellous bone. With types II and III fractures, the fractured segment may be displaced anteriorly, laterally, or posteriorly. Since posterior displacement of segment is more common, the prevalence of spinal cord injury is as high as 10% with these fractures. Initial management of a type I dens fracture is use of a cervical orthosis. Manage types II and III fractures by applying traction with cervical tongs. Occipital condyle fractures are caused by a combination of vertical compression and lateral bending. Avulsion of the condylar process or a comminuted compression fracture may occur secondary to this mechanism. These fractures are associated with significant head trauma and usually are accompanied by cranial nerve deficits. Radiographically, they are difficult to delineate, and axial CT may be required to identify them. These mechanically stable injuries require only orthotic immobilization for management, and most heal uneventfully. These fractures are significant because of the injuries that usually accompany them. Column disruption may lead to mechanical instability of the cervical spine. The degree of instability depends on several factors that may translate into neurologic disability, secondary to spinal cord compression. A full spectrum of cervical injuries with varying degrees of clinical importance, from the clinically insignificant to the potentially disastrous, exists. As many as 39% of cervical fractures have some degree of associated neurologic deficit. The risk of neurologic injury, secondary to spinal injury, increases with degenerative changes related to aging, arthritic conditions (rheumatoid arthritis, ankylosing spondylitis), spinal stenosis, spina bifida, and os odontoideum, as well as the specific mechanism and location of the injury. Cervical spine injuries cause an estimated 6000 deaths and 5000 new cases of quadriplegia each year. Male-to-female ratio is 4:1. Most patients with a cervical spine injury are in their prime and leading an active lifestyle prior to injury. Approximately 80% of patients are aged 18-25 years. For excellent patient education resources, visit eMedicineHealth's First Aid and Injuries Center. Also, see eMedicineHealth's patient education article Vertebral Compression Fracture. Kanwar R, Delasobera BE, Hudson K, Frohna W. Emergency department evaluation and treatment of cervical spine injuries. Emerg Med Clin North Am. 2015 May. 33 (2):241-82. [Medline]. Guarnieri G, Izzo R, Muto M. The role of emergency radiology in spinal trauma. Br J Radiol. 2016. 89 (1061):20150833. [Medline]. Winslow JE 3rd, Hensberry R, Bozeman WP, Hill KD, Miller PR. Risk of thoracolumbar fractures doubled in victims of motor vehicle collisions with cervical spine fractures. J Trauma. 2006 Sep. 61(3):686-7. [Medline]. Duane TM, Dechert T, Wolfe LG, Aboutanos MB, Malhotra AK, Ivatury RR. Clinical examination and its reliability in identifying cervical spine fractures. J Trauma. 2007 Jun. 62(6):1405-8; discussion 1408-10. [Medline]. Chilvers G, Janjua U, Choudhary S. Blunt cervical spine injury in adult polytrauma: incidence, injury patterns and predictors of significant ligament injury on CT. Clin Radiol. 2017 Aug 10. [Medline]. Mandadi AR, Waseem M. Trauma, Spine, Spinal Injury, Pediatric. 2017 Jun. [Medline]. [Full Text]. Pencle F, Mesfin F. Cervical, Disc Injuries. 2017 Jun. [Medline]. [Full Text]. Asemota AO. Whats New in Emergencies, Trauma and Shock? Addressing Cervical Spine Fractures. J Emerg Trauma Shock. 2017 Jan-Mar. 10 (1):1. [Medline]. Ivancic PC. 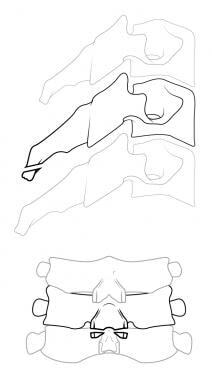 Odontoid fracture biomechanics. Spine (Phila Pa 1976). 2014 Nov 15. 39 (24):E1403-10. [Medline]. Shah K, Tikoo A, Kothari MK, Nene A. Current Concepts in Pediatric Cervical Spine Trauma. Open Orthop J. 2017. 11:346-352. [Medline]. Kill C, Risse J, Wallot P, Seidl P, Steinfeldt T, Wulf H. Videolaryngoscopy with Glidescope Reduces Cervical Spine Movement in Patients with Unsecured Cervical Spine. J Emerg Med. 2013 Jan 22. [Medline]. Aziz M. Use of video-assisted intubation devices in the management of patients with trauma. Anesthesiol Clin. 2013 Mar. 31(1):157-66. [Medline]. Yue JK, Chan AK, Winkler EA, Upadhyayula P, Readdy WJ, Dhall SS. A review and update on the guidelines for the acute management of cervical Spinal Cord Injury (SCI) - part II. J Neurosurg Sci. 2015 Sep 9. [Medline]. Darras K, Andrews GT, McLaughlin PD, Khorrami-Arani N, Roston A, Forster BB, et al. Pearls for Interpreting Computed Tomography of the Cervical Spine in Trauma. Radiol Clin North Am. 2015 Jul. 53 (4):657-74, vii. [Medline]. Quarrington RD, Jones CF, Tcherveniakov P, Clark JM, Sandler SJI, Lee YC, et al. Traumatic subaxial cervical facet subluxation and dislocation: epidemiology, radiographic analyses and risk factors for spinal cord injury. Spine J. 2017 Jul 21. [Medline]. INTERNATIONAL STANDARDS FOR NEUROLOGICAL CLASSIFICATION OF SPINAL CORD INJURY. American Spinal Injury Association. Available at http://asia-spinalinjury.org/wp-content/uploads/2016/02/International_Stds_Diagram_Worksheet.pdf. 2011; Accessed: August 18, 2017. Cui LW, Probst MA, Hoffman JR, Mower WR. Sensitivity of plain radiography for pediatric cervical spine injury. Emerg Radiol. 2016 Jun 20. [Medline]. Schleicher P, Scholz M, Kandziora F, Badke A, Brakopp FH, Ekkerlein HKF, et al. [Subaxial Cervical Spine Injuries: Treatment Recommendations of the German Orthopedic and Trauma Society]. Z Orthop Unfall. 2017 Jul 20. [Medline]. Berritto D, Pinto A, Michelin P, Demondion X, Badr S. Trauma Imaging of the Acute Cervical Spine. Semin Musculoskelet Radiol. 2017 Jul. 21 (3):184-198. [Medline]. Trafton PG. Spinal cord injuries. Surg Clin North Am. 1982 Feb. 62(1):61-72. [Medline]. Hu J, Yang KH, Chou CC, King AI. 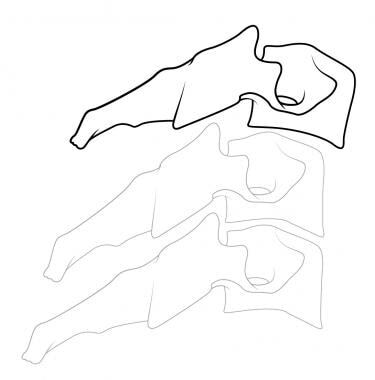 A numerical investigation of factors affecting cervical spine injuries during rollover crashes. Spine (Phila Pa 1976). 2008 Nov 1. 33(23):2529-35. [Medline]. Thompson WL, Stiell IG, Clement CM, Brison RJ. Association of injury mechanism with the risk of cervical spine fractures. CJEM. 2009 Jan. 11(1):14-22. [Medline]. Donaldson WF 3rd, Hanks SE, Nassr A, Vogt MT, Lee JY. Cervical spine injuries associated with the incorrect use of airbags in motor vehicle collisions. Spine (Phila Pa 1976). 2008 Mar 15. 33(6):631-4. [Medline]. Wang MC, Pintar F, Yoganandan N, Maiman DJ. The continued burden of spine fractures after motor vehicle crashes. J Neurosurg Spine. 2009 Feb. 10(2):86-92. [Medline]. Stein DM, Kufera JA, Ho SM, Ryb GE, Dischinger PC, O'connor JV, et al. Occupant and crash characteristics for case occupants with cervical spine injuries sustained in motor vehicle collisions. J Trauma. 2011 Feb. 70(2):299-309. [Medline]. Vanderlan WB, Tew BE, Seguin CY, Mata MM, Yang JJ, Horst HM, et al. Neurologic sequelae of penetrating cervical trauma. Spine (Phila Pa 1976). 2009 Nov 15. 34(24):2646-53. [Medline]. Beaty N, Slavin J, Diaz C, Zeleznick K, Ibrahimi D, Sansur CA. Cervical spine injury from gunshot wounds. J Neurosurg Spine. 2014 Sep. 21(3):442-9. [Medline]. Davidson JSD, Birdsell DC. Cervical spine injury in patients with facial skeletal trauma. J Trauma. 1989. 29:1276-1278. [Medline]. O'Malley KF, Ross SE. The incidence of injury to the cervical spine in patients with craniocerebral injury. J Trauma. 1988 Oct. 28(10):1476-8. [Medline]. Sinclair D, Schwartz M, Gruss J, McLellan B. A retrospective review of the relationship between facial fractures, head injuries, and cervical spine injuries. J Emerg Med. 1988 Mar-Apr. 6(2):109-12. [Medline]. Hills MW, Deane SA. Head injury and facial injury: is there an increased risk of cervical spine injury?. J Trauma. 1993 Apr. 34(4):549-53; discussion 553-4. [Medline]. Leonard JC, Kuppermann N, Olsen C, Babcock-Cimpello L, Brown K, Mahajan P, et al. Factors associated with cervical spine injury in children after blunt trauma. Ann Emerg Med. 2011 Aug. 58(2):145-55. [Medline]. Stiell IG, Clement CM, McKnight RD, et al. The Canadian C-spine rule versus the NEXUS low-risk criteria in patients with trauma. N Engl J Med. 2003 Dec 25. 349(26):2510-8. [Medline]. [Full Text]. Buckland AJ, Bressan S, Jowett H, Johnson MB, Teague WJ. Heterogeneity in cervical spine assessment in paediatric trauma: A survey of physicians' knowledge and application at a paediatric major trauma centre. Emerg Med Australas. 2016 Jul 28. [Medline]. Benayoun MD, Allen JW, Lovasik BP, Uriell ML, Spandorfer RM, Holder CA. Utility of computed tomographic imaging of the cervical spine in trauma evaluation of ground-level fall. J Trauma Acute Care Surg. 2016 Aug. 81 (2):339-44. [Medline]. Mulkens TH, Marchal P, Daineffe S, Salgado R, Bellinck P, te Rijdt B, et al. Comparison of low-dose with standard-dose multidetector CT in cervical spine trauma. AJNR Am J Neuroradiol. 2007 Sep. 28(8):1444-50. [Medline]. Nordin M, Carragee EJ, Hogg-Johnson S, Weiner SS, Hurwitz EL, Peloso PM, et al. Assessment of neck pain and its associated disorders: results of the Bone and Joint Decade 2000-2010 Task Force on Neck Pain and Its Associated Disorders. J Manipulative Physiol Ther. 2009 Feb. 32(2 Suppl):S117-40. [Medline]. Kumar Y, Hayashi D. Role of magnetic resonance imaging in acute spinal trauma: a pictorial review. BMC Musculoskelet Disord. 2016 Jul 22. 17:310. [Medline]. Maung AA, Johnson DC, Barre K, Peponis T, Mesar T, Velmahos GC, et al. Cervical spine MRI in patients with negative CT: A prospective, multicenter study of the Research Consortium of New England Centers for Trauma (ReCONECT). J Trauma Acute Care Surg. 2017 Feb. 82 (2):263-269. [Medline]. Utz M, Khan S, O'Connor D, Meyers S. MDCT and MRI evaluation of cervical spine trauma. Insights Imaging. 2014 Feb. 5 (1):67-75. [Medline]. Hagedorn JC 2nd, Emery SE, France JC, Daffner SD. Does CT Angiography Matter for Patients with Cervical Spine Injuries?. J Bone Joint Surg Am. 2014 Jun 4. 96(11):951-955. [Medline]. Goode T, Young A, Wilson SP, Katzen J, Wolfe LG, Duane TM. Evaluation of cervical spine fracture in the elderly: can we trust our physical examination?. Am Surg. 2014 Feb. 80(2):182-4. [Medline]. Srinivas BH, Rajesh A, Purohit AK. Factors affecting outcome of acute cervical spine injury: A prospective study. Asian J Neurosurg. 2017 Jul-Sep. 12 (3):416-423. [Medline]. National Spinal Cord Injury Statistical Center (NSCISC). Spinal Cord Injury. Facts and Figures at a Glance. Birmingham, Ala: NSCISC; July 1996. Nordin M, Carragee EJ, Hogg-Johnson S, Weiner SS, Hurwitz EL, Peloso PM, et al. Assessment of neck pain and its associated disorders: results of the Bone and Joint Decade 2000-2010 Task Force on Neck Pain and Its Associated Disorders. Spine. 2008 Feb 15. 33(4 Suppl):S101-22. [Medline]. Stassen NA, Williams VA, Gestring ML, et al. Magnetic resonance imaging in combination with helical computed tomography provides a safe and efficient method of cervical spine clearance in the obtunded trauma patient. J Trauma. 2006 Jan. 60(1):171-7. [Medline]. Stiell IG, Wells GA, Vandemheen KL, et al. The Canadian C-spine rule for radiography in alert and stable trauma patients. JAMA. 2001 Oct 17. 286(15):1841-8. [Medline]. (A) Normal lateral projection shows the relationships of anterior, posterior, and spinolaminar lines and prevertebral spaces. (B) Normal oblique projection shows the normal appearance of the laminae as shingles on a roof forming a regular elliptical curve with equal interlaminar spaces.